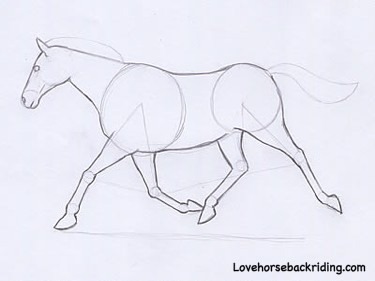 When drawing horses, details are what give the the horse it’s “life” and realistic qualities. You may want to click on "tutorial beginning" if you just joined in and missed how we got to this point. That way you can get started correctly. Don't worry you'll be back here at just the right time. If you have been following along you are now on step five where the outline will be finished and you'll finish your details and drawing. (i) Start by drawing and finishing the outline of the upper half of the body. Notice the withers gently slope into the horse's back. This comes from the top of your biggest body circle. You'll keep it simple for starting the eye by following the shape seen in the picture above. Draw a slightly curved line above the neck where the tresses will be. The hair here is free flowing. A running horse's tresses will blow in the wind above their back as they move just like ours does. Horses will naturally lift their tail bone a bit when they are running or excited. That makes the hair a look a bit narrower at the top. That along with the wind catching the hair will send it flowing out behind them. Since you are doing a side view you won't see the other eye. As you can see there is a thin line drawn from around the eye down to the nostril. This will make your drawing more realistic by adding dimension to the face by indicating the bone beneath. For this drawing it will include the body and face circles, some of the triangles, and the leg join shapes. Here comes the fun part! Who doesn’t love drawing a long tail held proud and flowing in the wind? Use a series of thin pencil strokes using your outline as a guide to finish the locks. Follow the indications above including on the neck, shoulder, elbow, and flank. This helps show the horses running action and gives more detail. 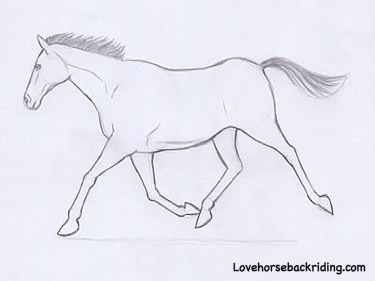 See, drawing horses isn't so hard is it? You finished this one! How did it turn out? If you are interested in trying some different tutorials go here.